Join the URA online on our secure server. This is our preferred method. Since 2008, URA‐AFT has been a member‐led organization. The power of URA‐AFT is in the membership. If you are not a member, you are relying on your member‐colleagues to create the power on your behalf. As a non‐member you are simply “watching from the sidelines” and weakening our collective strength. If you prefer to download a hard copy of the membership application to print, sign and return, you may do so here. 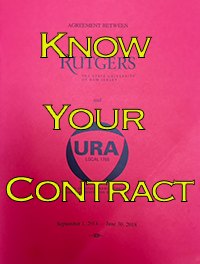 Your union job already provides job security, fairness in hiring and disciplinary practices, scheduled pay raises, and the ability to negotiate directly with Rutgers’ decision‐makers. Only unions have guaranteed Weingarten Rights and collective bargaining rights guaranteed by New Jersey statute. Only members can participate in the union with voting privileges on important union issues including contract ratification and elections of officers. Your membership works on your behalf too–more members mean a stronger voice with Rutgers and in Trenton and Washington to shape policies that affect our retirement, healthcare and working conditions. Recent accomplishments include: health benefits oversight, paid family leave rights, stronger union rights in the work place, and guaranteed paid sick leave. Your dues support the operations of URA‐AFT. A percentage goes to the American Federation of Teachers (AFT), which provides us with national support on a range of important issues. The majority stays with URA‐AFT to fund bargaining, legal, outreach and educational activities. 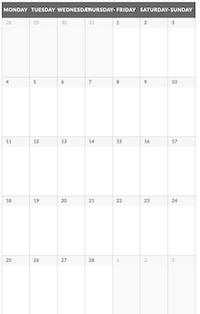 Dues are set at 1.2% of your annual base salary (divided by each bi‐weekly paycheck). URA members voted in favor of these dues in 2007. No dues are paid on bonus or lump‐sum payments or overtime pay, only base salary. You can use the chart below to calculate your URA‐AFT dues; use your final pay stub each year to calculate actual dues paid for tax deduction purposes. 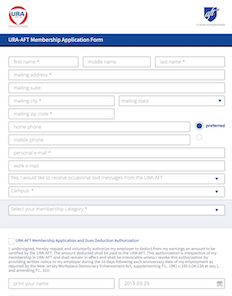 Complete a membership application to join URA‐AFT today. Your steward can collect the application or call your URA local office at 732–745-0300 to arrange for pick up.